1.Prepare outdoor grill for direct grilling over medium-high heat. In small saucepot, cook cream over medium-high heat 3 minutes or just until cream simmers. Reduce heat to medium; simmer 10 to 12 minutes or until cream is reduced to 1/2 cup, stirring occasionally during last 5 minutes of cooking. Remove saucepot from heat; whisk in lemon juice, butter, tarragon and 1/8 teaspoon each salt and pepper. Cover to keep warm. Makes about 2/3 cup. 2.Meanwhile, in large bowl, toss asparagus with oil and 1/4 teaspoon each salt and pepper. Place asparagus on hot grill rack; cover and cook 6 minutes or until asparagus is tender-crisp, turning occasionally. 3.Fill large skillet or sauté pan with enough water to come halfway up sides. Add vinegar and remaining 1/4 teaspoon salt; heat to boiling over medium-high heat. Reduce heat so that water is barely simmering. Crack eggs, 1 at a time, into small cup. Slowly slide each egg into water while immersing cup slightly in water. Cook 4 minutes. Egg whites should be cooked through and yolks should be soft. With slotted spoon, transfer each egg to paper towel-lined plate. If desired, with paring knife, trim off any loose egg white. 4.Divide asparagus between each of 4 salad plates. 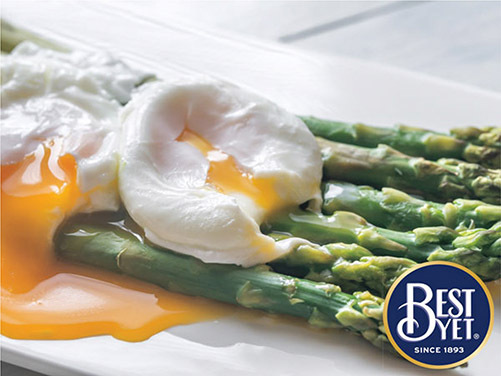 Carefully place 1 egg over asparagus on each plate; pour about 2-1/2 tablespoons sauce over egg and asparagus.